CEOs of funded startups tend to be a well-educated bunch, at least when it comes to university degrees. Yes, it’s true college dropouts like Mark Zuckerberg and Bill Gates can still do well. But Crunchbase data shows that most startup chief executives have an advanced degree, commonly from a well-known and prestigious university. Earlier this month, Crunchbase News looked at U.S. universities with strong track records for graduating future CEOs of funded companies. This unearthed some findings that, while interesting, were not especially surprising. Stanford and Harvard topped the list, and graduates of top-ranked business schools were particularly well-represented. In this next installment of our CEO series, we narrowed the data set. Specifically, we looked at CEOs of U.S. companies funded in the past three years that have raised at least $100 million in total venture financing. Our intent was to see whether educational backgrounds of unicorn and near-unicorn leaders differ markedly from the broad startup CEO population. Here’s the broad takeaway of our analysis: Most CEOs of well-funded startups do have degrees from prestigious universities, and there are a lot of Harvard and Stanford grads. However, chief executives of the companies in our current data set are, educationally speaking, a pretty diverse bunch with degrees from multiple continents and all regions of the U.S. The rankings aren’t hugely different from the broader population of funded U.S. startups. In that data set, we also found Harvard and Stanford vying for the top slots, followed mostly by Ivy League schools and major research universities. For heavily funded startups, we also found a high proportion of business school degrees. All of the University of Pennsylvania alum on the list attended its Wharton School of Business. More than half of Harvard-affiliated grads attended its business school. MBAs were a popular credential among other schools on the list that offer the degree. When it comes to the most heavily funded startups, the degree mix gets quirkier. That makes sense, given that we looked at just 20 companies. One surprise finding from the U.S. startup data set was the prevalence of Canadian university grads. 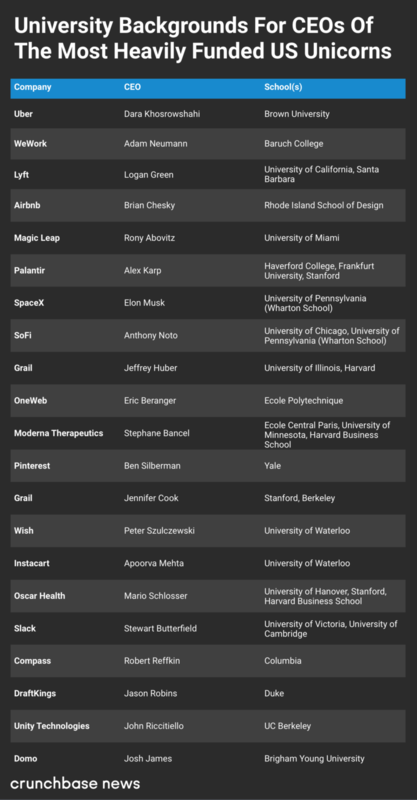 Three CEOs on the list are alums of the University of Waterloo . Others attended multiple well-known universities. The list also offers fresh proof that it’s not necessary to graduate from college to raise billions. WeWork CEO Adam Neumann just finished his degree last year, 15 years after he started. That didn’t stop the co-working giant from securing more than $7 billion in venture and growth financing. Several CEOs attended more than one university on the list.